As we wrap up the Old Schoolhouse Magazine’s Review Crew year, I’ve received some pretty fun stuff to review with Charlotte from Fundanoodle. I received I Can Cut, I Can Do Math Level 1, and Max and Alphie’s Adventure Level 1, all part of the “Orange” level for 3 year olds, or preschool level. Charlotte turned three last week – partway through the review. While it was obvious she was a beginner learning these skills (and her I Can Cut! Activity Book looks like a slight massacre has maimed it for life) she had a BLAST doing these books. Thrilled with the concept of “doing school” alongside her older siblings, she took her work with an incredibly serious attitude and worked her little heart out on these. She did 1-3 pages per school day in each book, and they took her usually 5-10 minutes per book, depending on how meticulous she decided to be. The I Can Cut! Activity Book was by far her favorite, complete with the pair of safety all-plastic scissors that came with the book. While I didn’t check to see if they cut hair, I don’t think they will. They’re pretty perfect for a first pair of scissors. She cut up those pages to pieces, sometimes more accurately than others, but her ability to hold and control scissors greatly improved as she went. The other two books I received cover counting, patterns, and looking at pictures to find missing objects. She didn’t get the concept at the beginning. (When told to circle all the houses, she circled ALL of the houses. And everything else on the page – with one GIANT circle. Talk about the letter of the law more than the spirit of it!) Now, several weeks later, she takes to the directions like a pro – and I learned to demonstrate my desires just a little bit more clearly! The I Can Do Math! Activity Book was a little bit above Charlie’s head. Attributing a number to a single object is something she’s still learning, and despite trying to get her to count objects and give each a number, to find which square had more, etc., she really didn’t get this. She, however, did not realize she wasn’t getting it and had a fabulous time in the meantime. I learned to let it go, give her the instructions, and let her do it wrong. It’ll be okay. The stickers… oh, the stickers. Charlotte loved finding the “right” sticker for the page and placing it, ever so carefully, exactly in the right spot. There’s nothing wrong with her hand-eye coordination, for certain. Her sticker placement was exact and perfect. She never, ever forgot to grab her sticker to mark the page completed. These were quite possibly her favorite part of the two books (I Can Do Math! and Max and Alphie’s Adventures!) that contained them. Such fun. When Charlotte saw me working on this review, and saw photos of “her school”, she was concerned she wouldn’t get to keep it. Suffice it to say, she really, really has enjoyed these books and will continue to do them each day. All three of the books I received are 9” x 12”. I Can Cut! 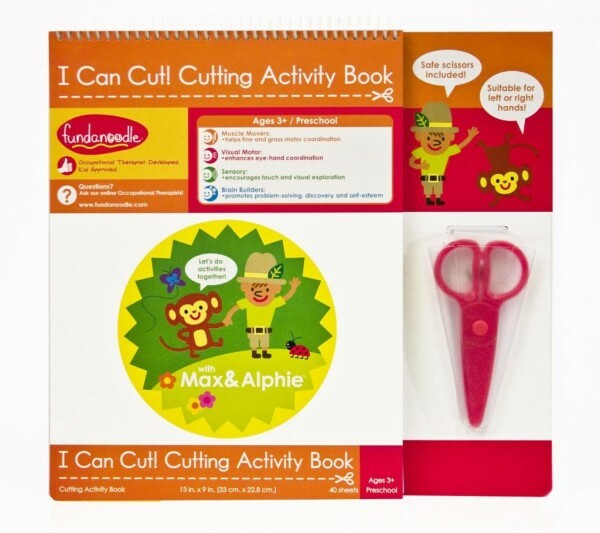 Cutting Activity Book contains 40 worksheets and is $7.99, I Can Do Math! Level 1 contains 40 pages plus sticker sheets containing a sticker reward for each page and is $5.99, and Max and Alphie’s Adventures! 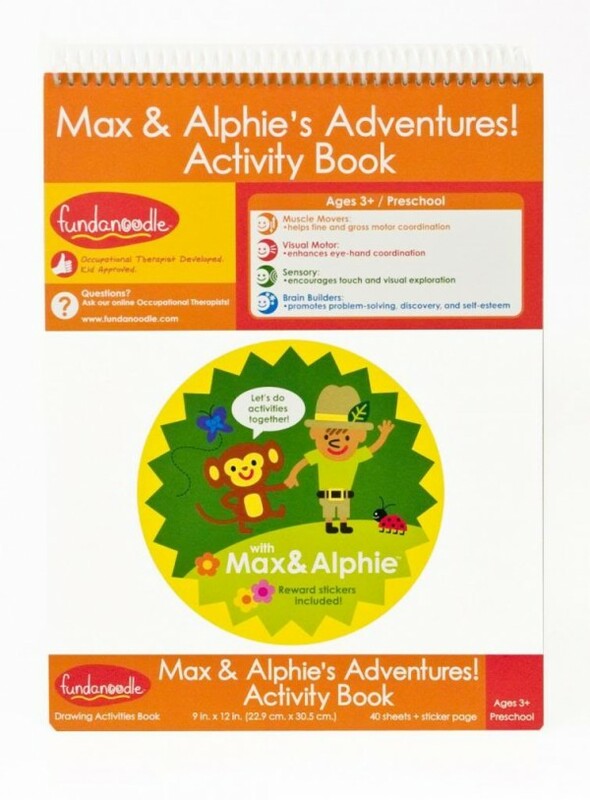 Activity book contains 40 pages plus stickers for $5.99. To read more reviews of these books, more Orange level books and other levels and books offered by Fundanoodle, visit the Review Crew Blog. Sounds like she did pretty well for a 3 year old. My 22 month old great granddaughter loves stickers too. She just puts them in a blank book anyway she wants too right now. Haha!!! I love her enthusiasm! Thanks for sharing! What wonderful and thorough review! Thank you so much for writing about us. I love that she improved with the scissors over time! It definitely takes practice. I also love the fact that she circled everything in one big circle! Too funny! 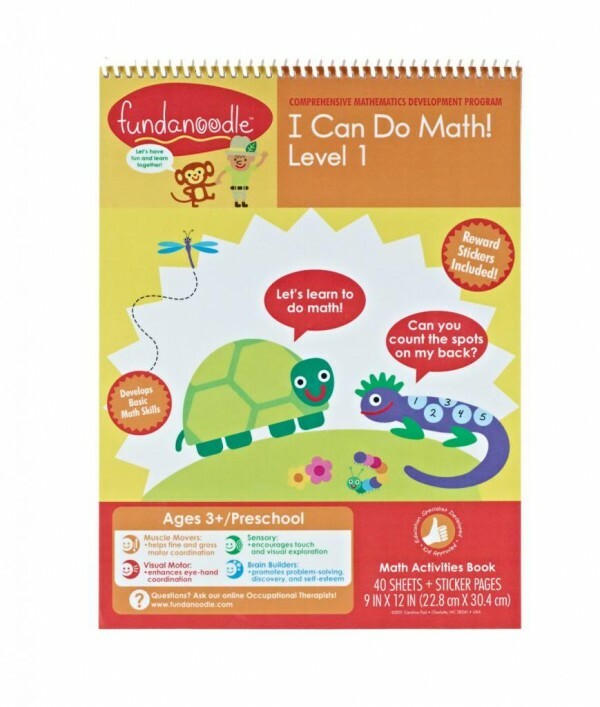 We’re glad you enjoyed our products and hope you will continue using Fundanoodle!